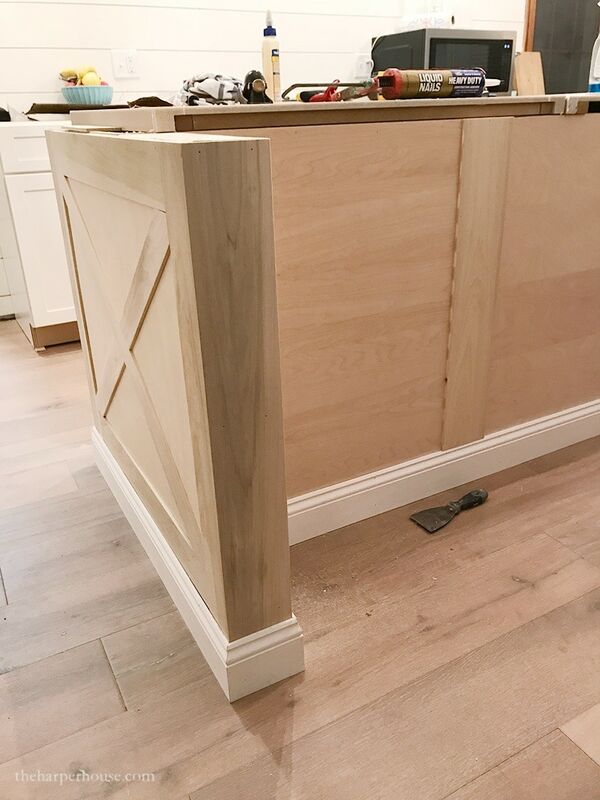 One of the ways you can add detail to an otherwise builder-grade kitchen is by installing custom kitchen island trim. Since this is our somewhat-forever-home (at least for the next 10 years or so) I budgeted for specific items that I really really wanted and chose to save money on other things that weren’t super important to me. 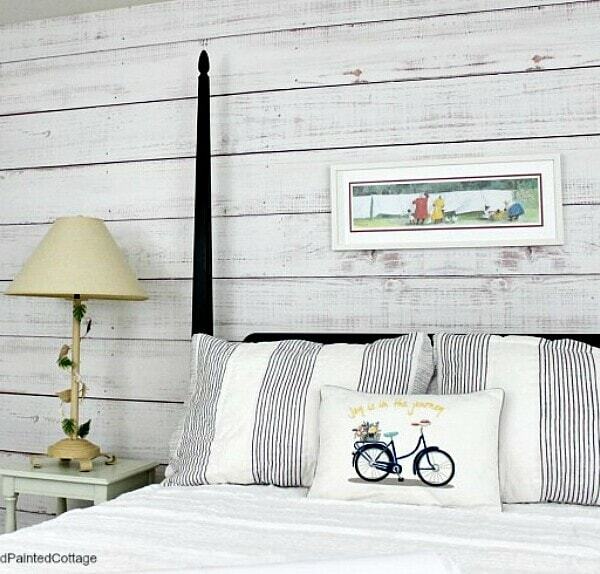 But thankfully since Craig is such an awesome carpenter, we’re usually able to get a similar custom look diy-style! 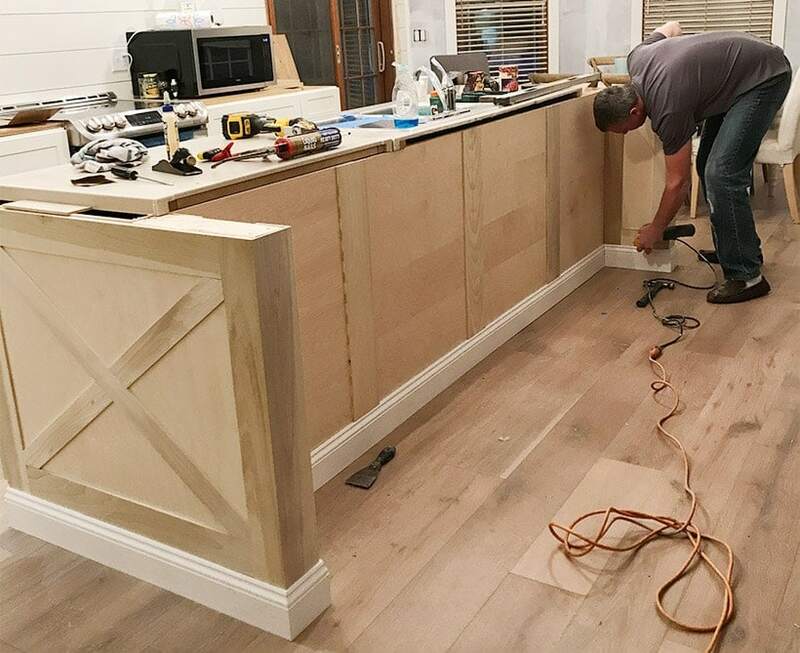 So instead of ordering fancy end panels for the island from the cabinet place (that cost beaucoup $$) I had him build our own custom panels. 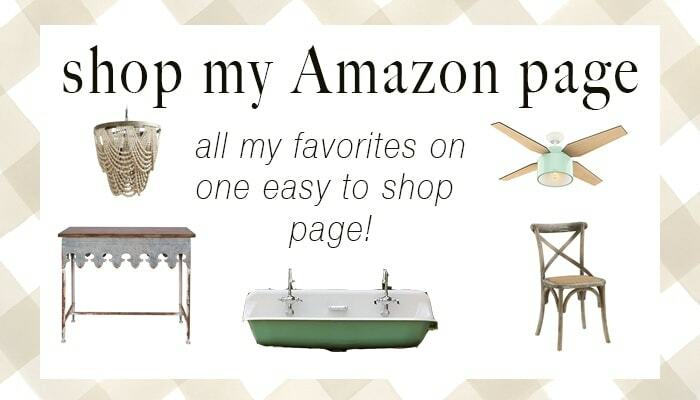 ** this post may contain affiliate links. see my full disclosure here. We searched through tons of inspiration pics on Pinterest and Instagram and settled on an x style design for the end panels. I wanted the ends of the island to be beefy and substantial. 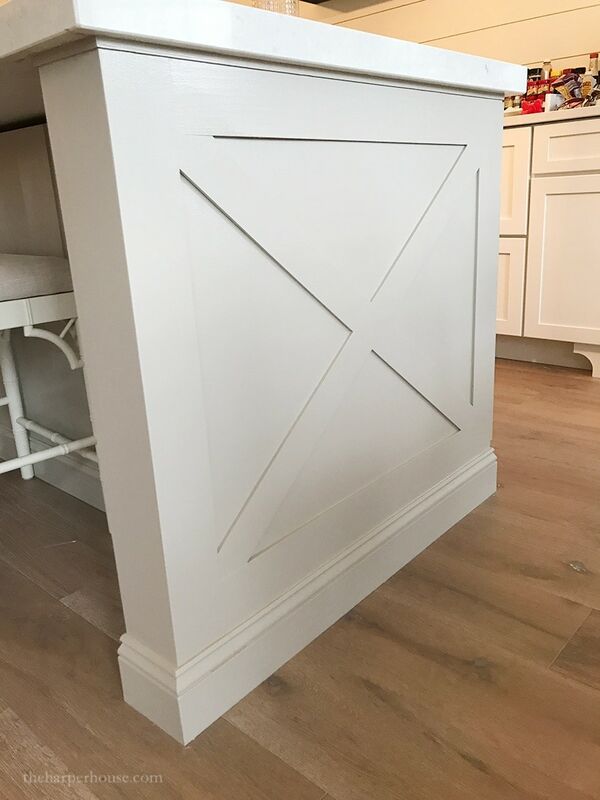 We added similar x style detail to the ends of the island at Mouse House, but created the panels for this new kitchen to be the full 40″ wide to support the island countertop without the use of corbels. 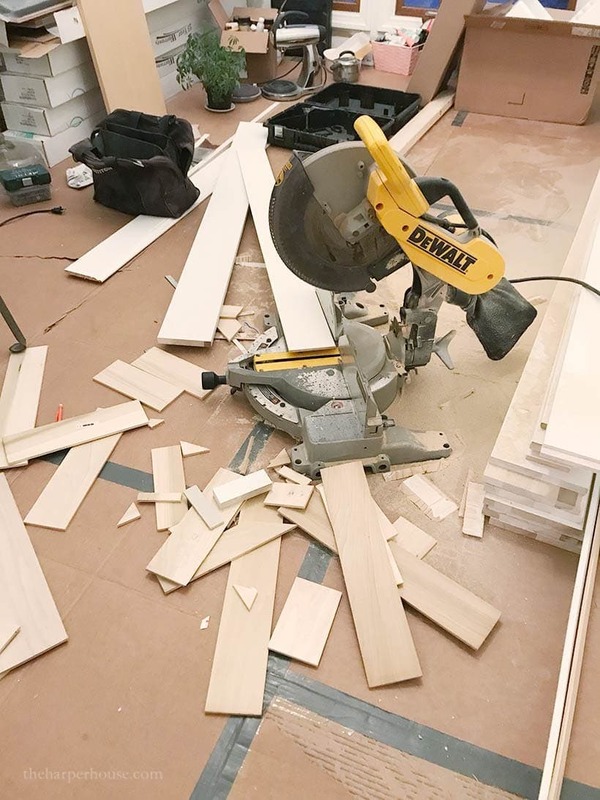 He extended the island depth by building a small wall with 2×4’s and wrapping it in 1/4″ maple plywood. 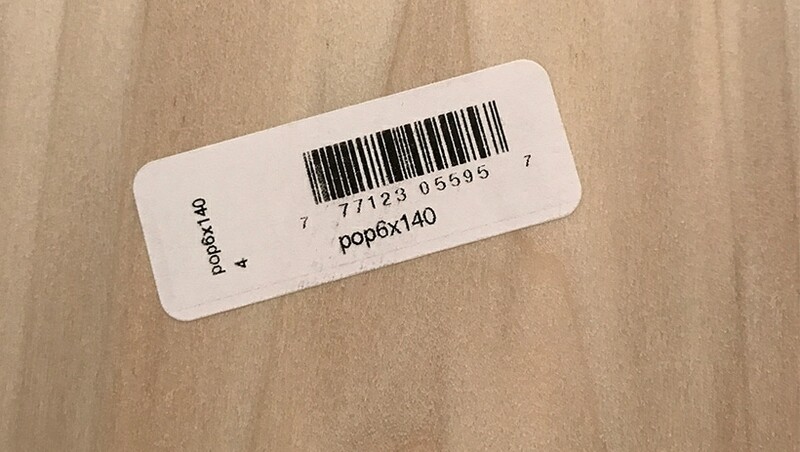 He then used smaller, thin poplar boards from Lowes to create the x design. He attached the x board pieces to the plywood with a pin nailer using 23 gauge size nails (and he used his 18 gauge nailer on the corner pieces) He’s got so many tools – at least he’s putting them to good use with all these projects! 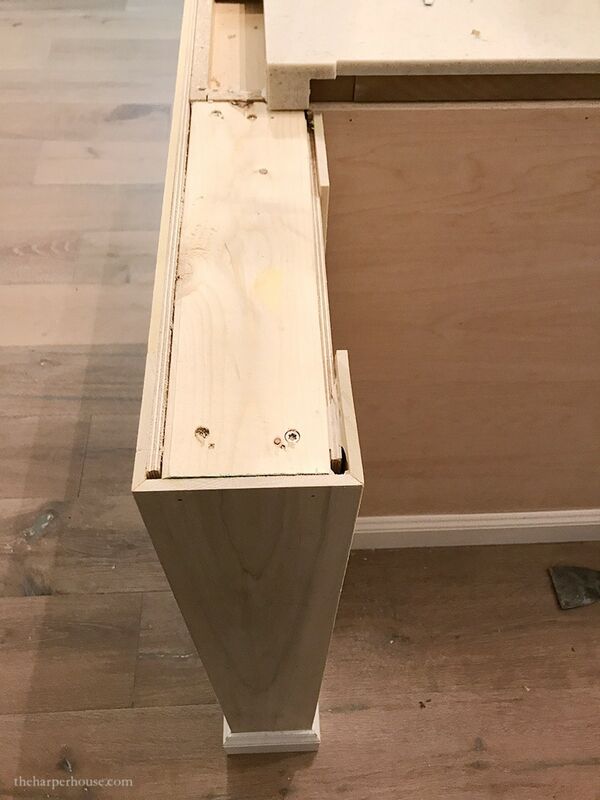 Then for the back of the island, we just decided to attach the thin poplar boards every 24″ to give a little detail (he attached them over the maple plywood.) I will have 3 barstools at the island so the back won’t be very noticeable. 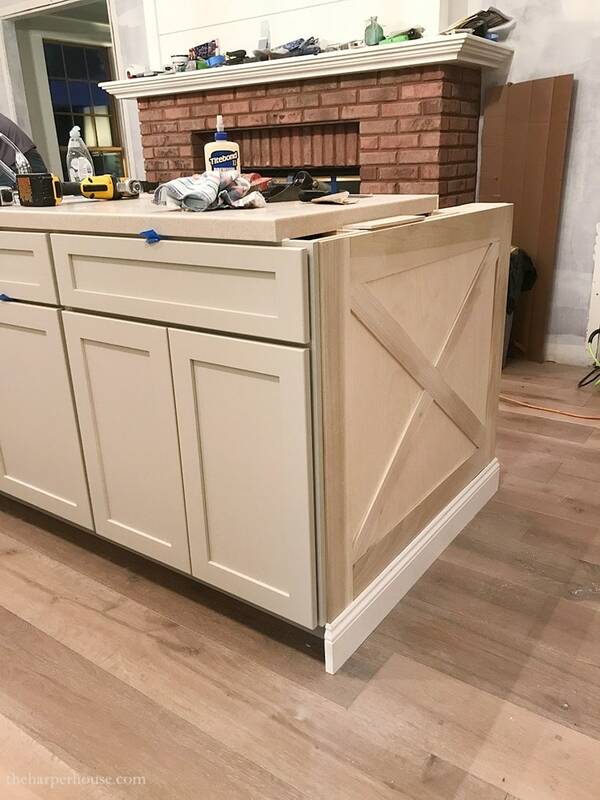 I love how the kitchen island trim turned out! 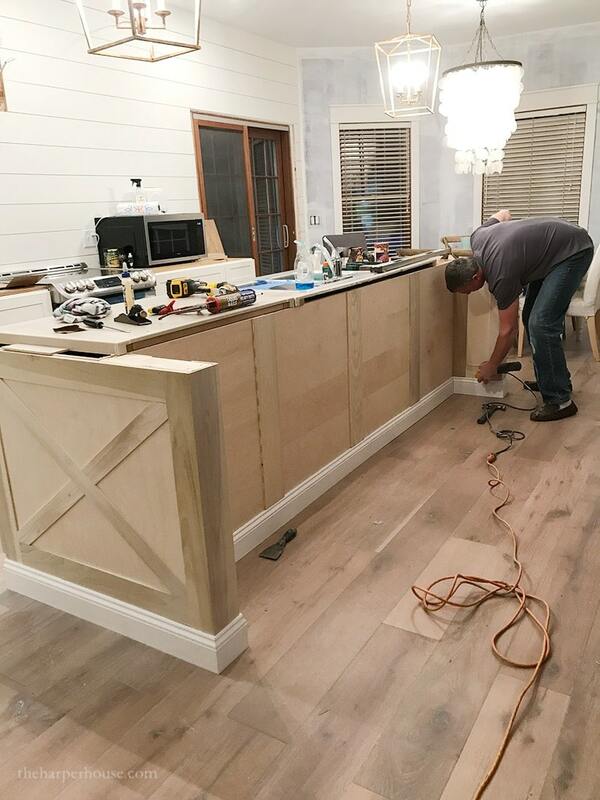 Sneak peek – there’s our new counter top! They were delivered last week and I AM IN LOVE! Thank the Lord, because I was not able to see a full slab prior to ordering but they truly look GORGEOUS. 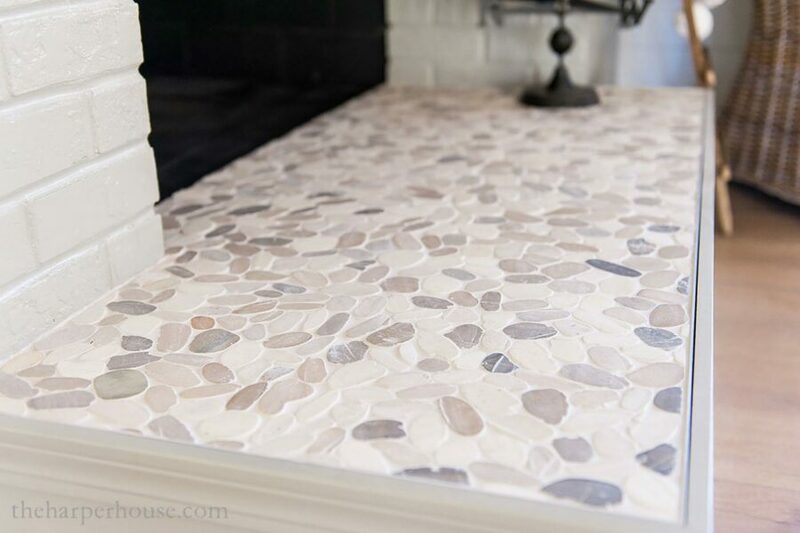 Full post to come on countertops, so stay tuned! 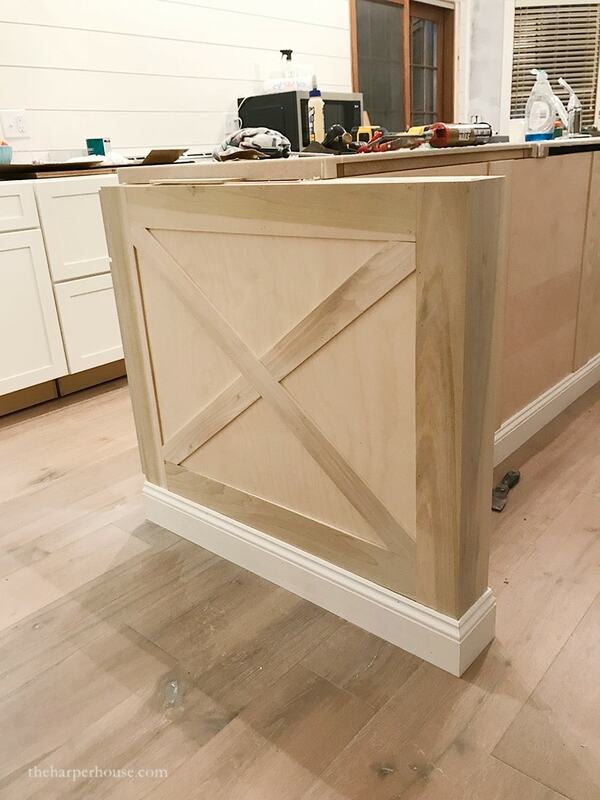 On the front of the island, Craig built little curved “feet” to add a finished touch to the island. 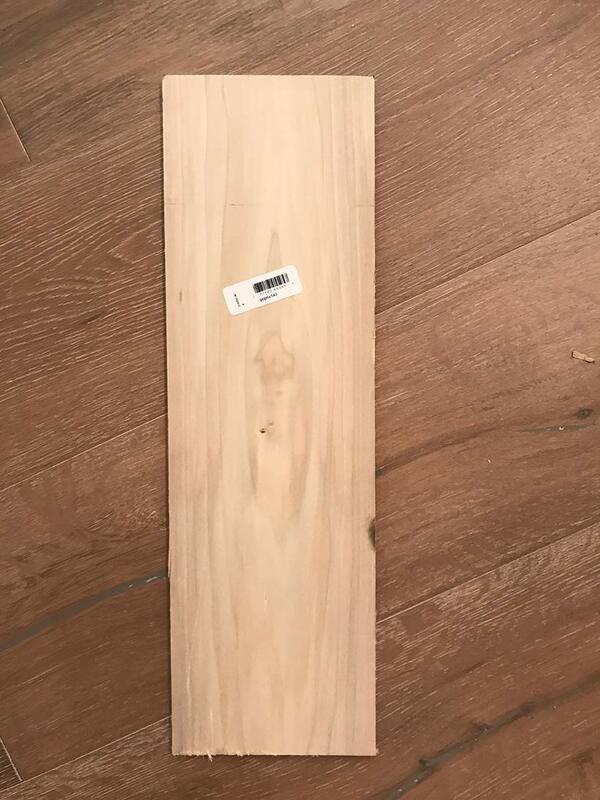 We just drew out a sample on cardboard and held it up to the island to see if we had the size right. Then he cut out the “feet” from a 1×6 board with his jig saw, then sanded and painted to match the island. I love how it turned out! 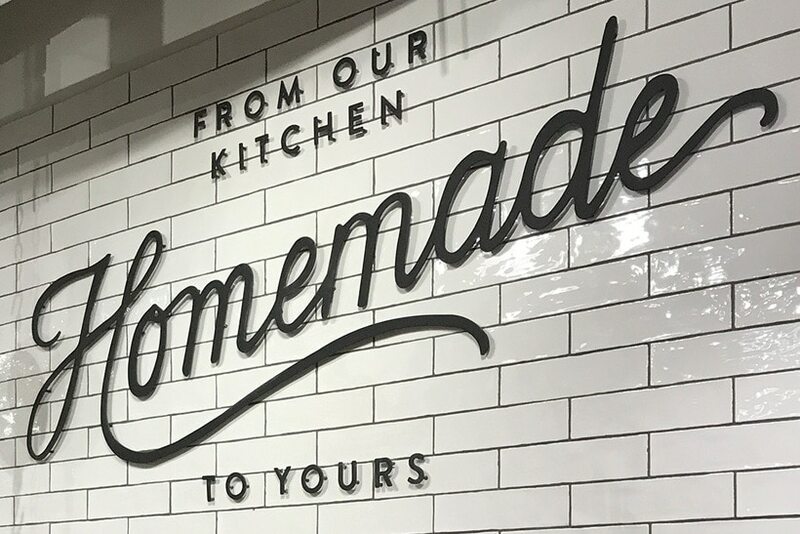 You may have also noticed, our new kitchen pendants. I have been in love with the Darlana pendant lights from Visual Comfort for years and I finally took the plunge and bought them for the kitchen. I think the gold color adds some much needed warmth to the space. I ordered the small size from One Kings Lane when they were having a 20% off sale and they arrived in one week! 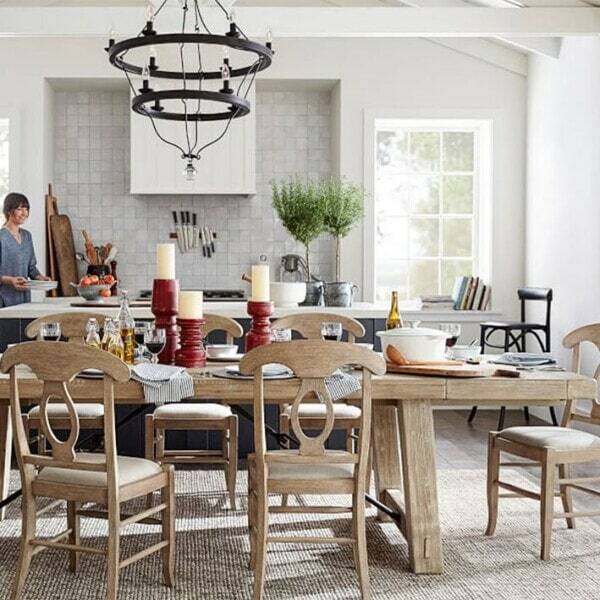 For over our dining table, I was finally able to use this gorgeous capiz chandelier that I bought from Pottery Barn about 8 years ago. We had originally planned on building a giant farmhouse on 10 acres until God told Us No. 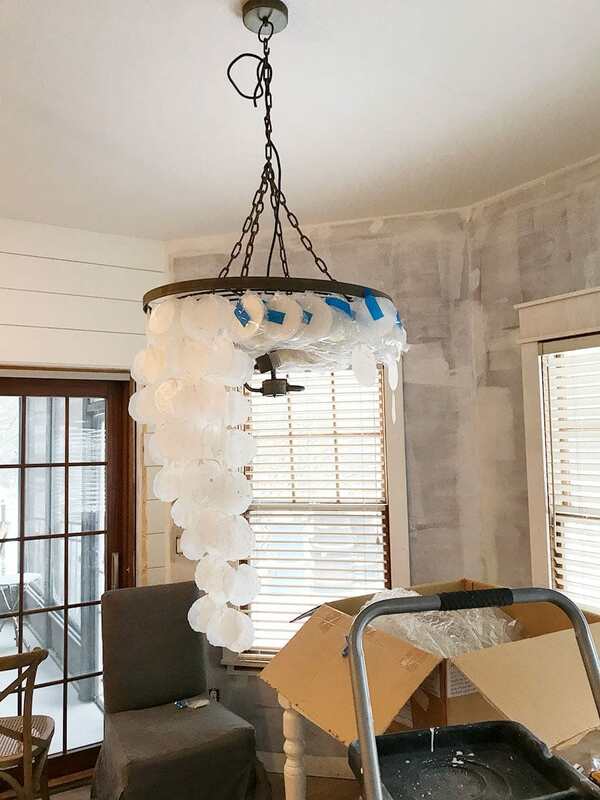 So this was one of the light fixtures I had purchased in the hopes of putting it in the new build and it had been sitting in our attic ever since. So glad I finally found a home for it! I love it…but that thing was a PAIN to unwrap. There were about 100 strands of shells and each were INDIVIDUALLY wrapped. Took me about an hour to finally free all those shells. But it was worth it. 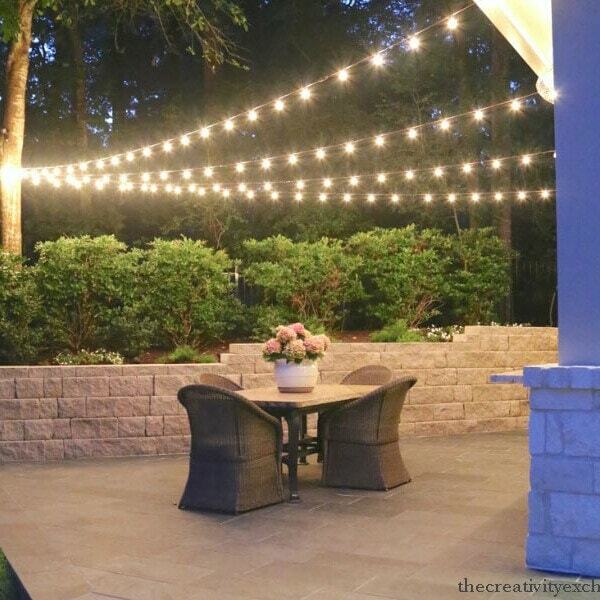 I love how it looks and it’s large enough to make a statement, but still coordinates really well with the Darlana lanterns. 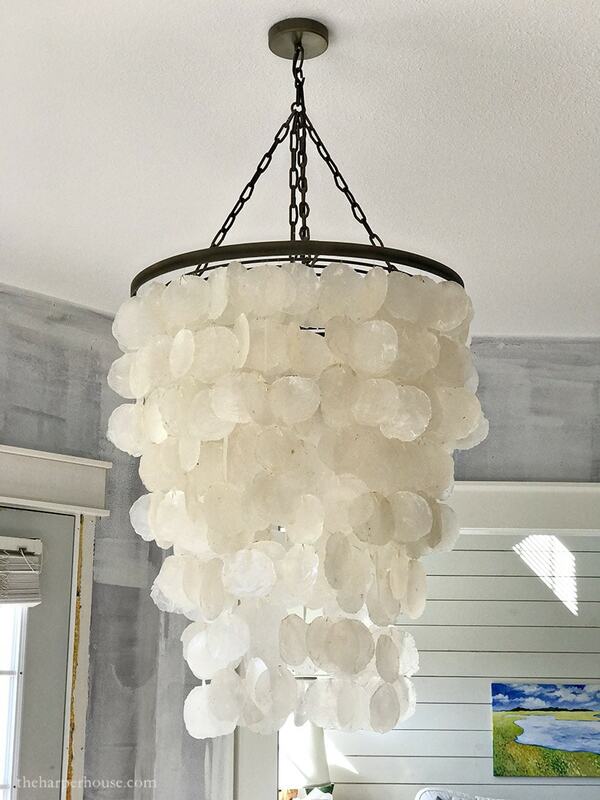 Unfortunately, Pottery Barn no longer sells this particular chandelier but I’ve found some similar versions: this one is only $233 and this one is a bit more modern but SO gorgeous! And here’s an even cheaper version with teardrop shaped shells, so pretty! 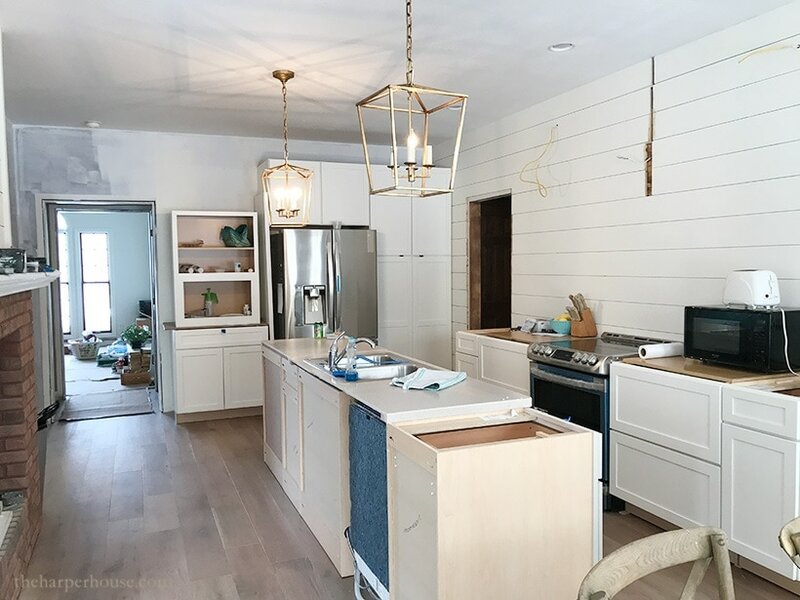 The kitchen is starting to look like a real kitchen finally – this week, we’re trying to design the stove hood but I can’t decide what kind of wood to use… I want something light and a little rustic. Do you have any ideas? Share with me in the comments! Your island is gorgeous! Well done!! Hi Christy. First of all, absolutely love the kitchen and the island is amazing!!! I had the same idea on the X design on the sides so this couldn’t be more perfect timing. 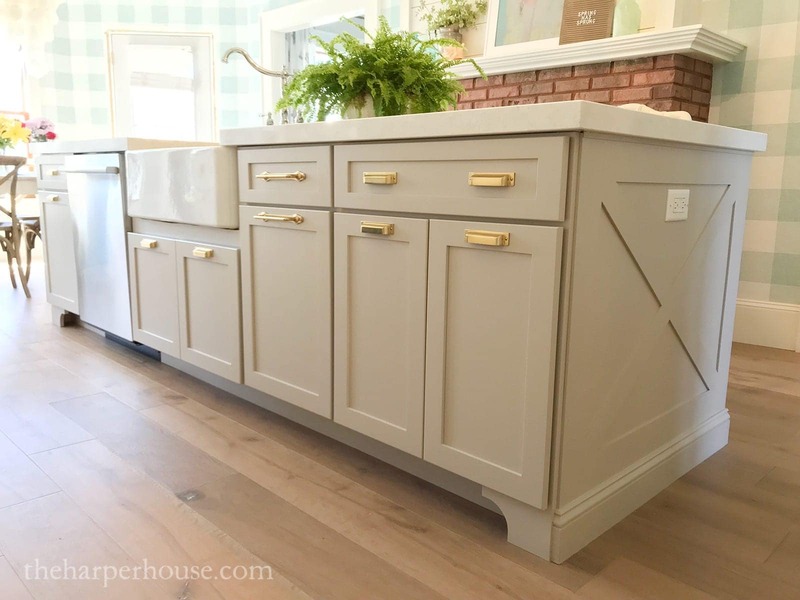 Question … the cabinets that you used throughout the kitchen, where did you get them from / brand as I really love the style of the doors. 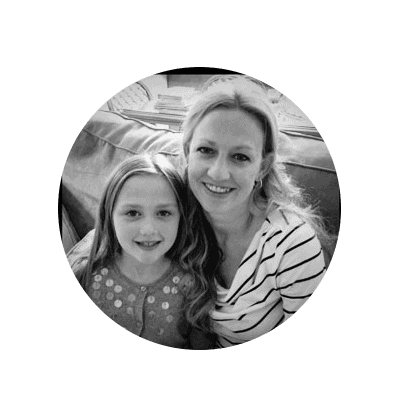 Disregard … I found your earlier blog with the cabinet details =). Thanks for always sharing such great details!! aw, thanks for your sweet comment Tina! Yes, we purchased these cabinets at our local Menards (they are the Medallion brand) Super affordable, soft close drawers, great color options, lots of customization options as well (although the more you customize, the pricier they will be.) I hope to write another post soon with more details (still waiting to get some good photos.) Hope this helps! Did you paint with a sprayer or a gold old fashion brush? It looks amazing and very high end. 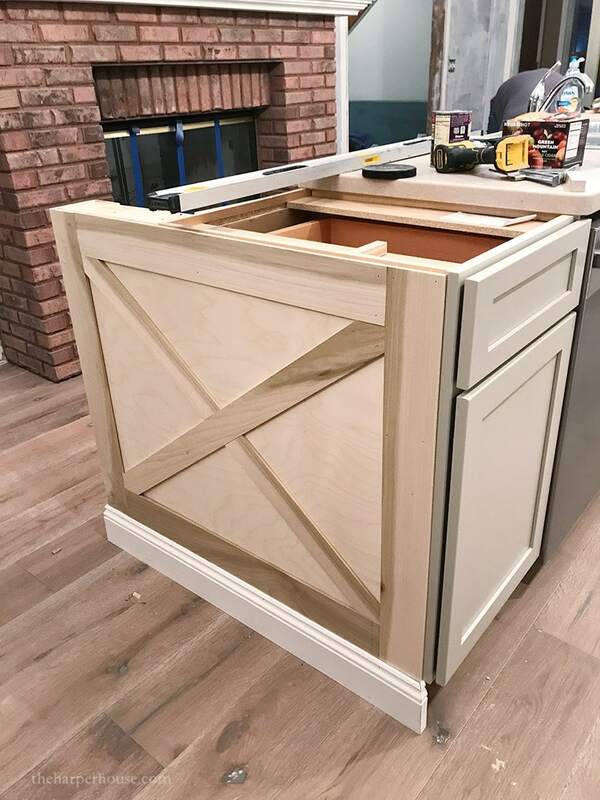 Im trying to convince my husband to do the same for our island i got quotes to get black shaker cabinets with these X end panels and everyone keeps saying 6000-7000 which is over our budget for just the island. Great post! Can you ask your husband how he figured out what angle to cut the x boards at the ends? Did he use a protractor? He did not use a protractor. He just found the center line of the angle, then extended the 2.5″ board past the edge to find the place to mark with his pencil for the angle cut. 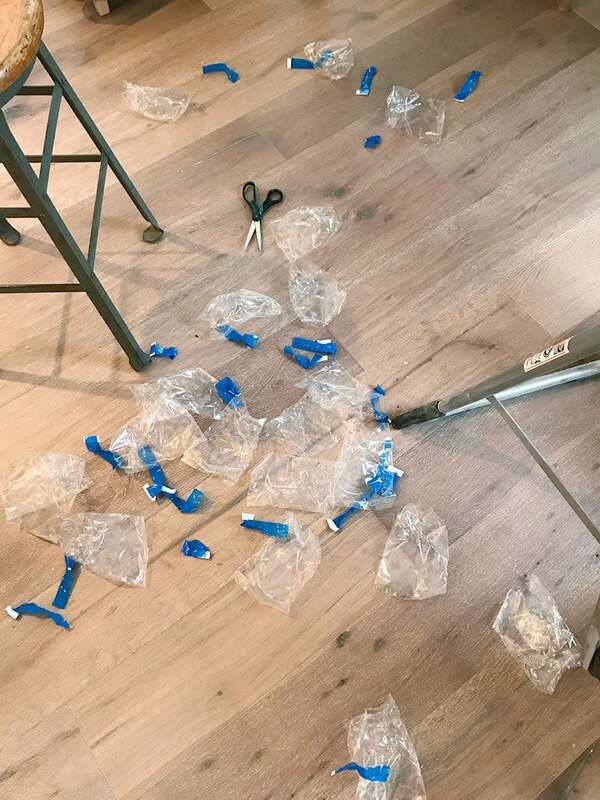 I’m sure I am not explaining this very well….it’s really hard to explain without a visual. Sorry! No worries. I think I can figure it out with a few trial cuts lol. Do you have any more pictures of your island finished? I will try to add some more pics to this post this week – just got back from vacation 🙂 Good luck with your project! Very detailed post! I’m working on a custom island design and this is perfect. I appreciate the details and the close up photos of how you guys did this! 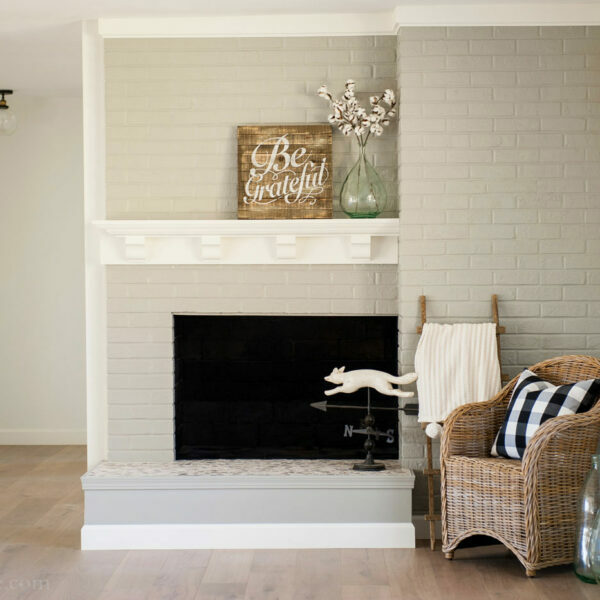 What is the distance from the island to the fireplace? May I ask how wide and thick the uprights on the back of the island were kept at? Love this. I’m doing something similar for my wife. What did you do up front under the cabinet where there is notlrmally a cut out for your feet when your standing close to the cabinet? Thanks so much Brian! Are you talking about the toe kick on the front of the island? If so, we kept the toe kick on the front, but my hubby added cute little “feet” on the corners. We just decided on an angle and made a cardboard template and cut them out of wood with a jig saw, then painted to match the island. 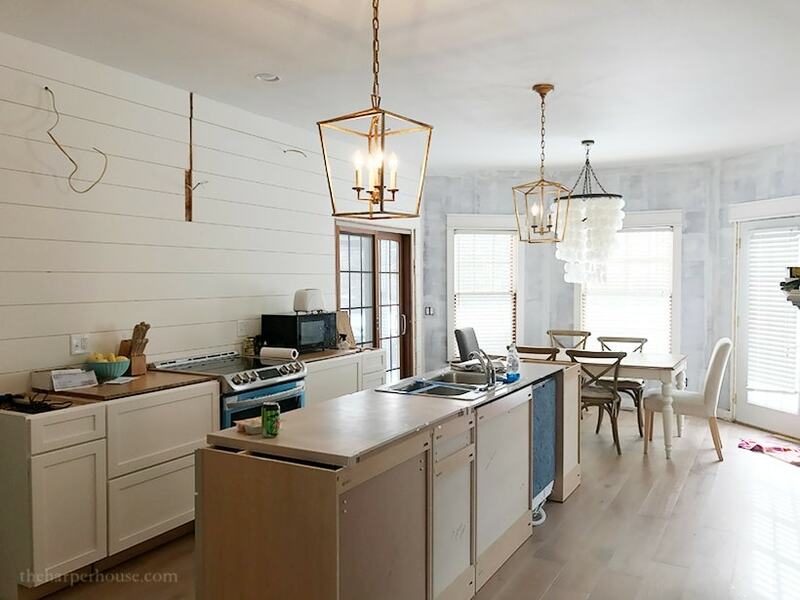 I think it gives the cabinets a more custom feel and adds a nice finished touch to the island. I’ve added another pic to the post so you can see what I’m talking about. Hope this helps and good luck with your project!